Earth day is coming, and while the sky is not falling, temperatures are still rising. Bad economy or not, we all need to chip in a little to help our mother, Mrs. Earth. 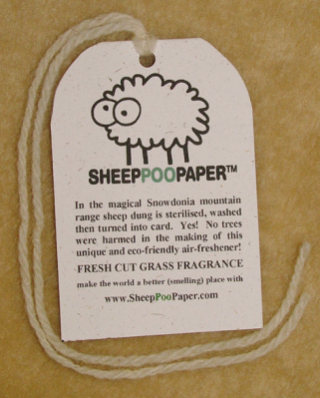 If you're looking for something really unique to outdo your eco-buddies, any of these eight goodies is sure to make you only one in your friend circle with something so strange. Ever wish you could feel a little closer to Spike, Spot or Fluffy? Maybe even wish you could try on their fur and walk around like a critter all day? Now's your chance! 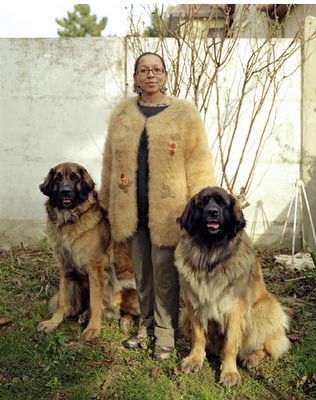 Actually though, pet fur fabric is a great way to make renewable clothing from something wasted otherwise. The fur is always cleaned and detangled before it is spun into yarn. Really, is it that much different than wool or angora fabric? When you get out of the shower are you dying to rub your clean feet on something dirty and earthy? 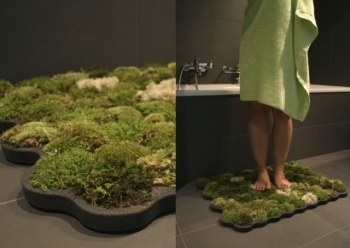 The living bath mat is just what you need to bring you back to nature. The water dripping from your wet body actually helps the moss grow. Plus, this moss won't attach to your feet and filth up your feet or other flooring. Maybe you weren't the best to the environment, but darnit, your baby hasn't destroyed anything yet. 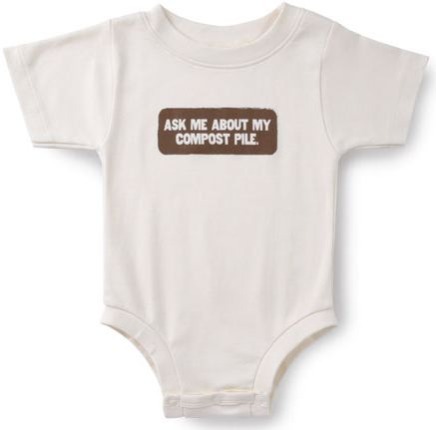 Whether your child wants to be condescending with a onesie reading "Thanks For All the Global Warming," cutsie with a "Give A Hoot, Don't Pollute" shirt, or even disgusting in a onesie reading "Ask Me About My Compost Pile," strangers everywhere are sure to take a second look at your sassy starlet. And lest you worry about making your baby a hypocrite, all three tees are organic. Oh, and if your child is actually the K-9 variety, there are plenty of cute eco-friendly shirts for pups as well. Ready to silently remind everyone about global warming? These thermometer earrings are exactly what you need for those hot days and frigid nights -remember now it's all about overall global climate change, not just warming. Every year, trillions of stinky, potentially fire-causing cancer sticks are littered in our streets, forests and beaches. It's an environmental disaster and, up until now, all we could do is throw the butts in the trash and await their retirement in a landfill. Fortunately, Chilean designer Alexandra Guerrero has figured out a way to sanitize the filters and knit them into a wool-like fabric. The result is surprisingly attractive and stylish. What better way to celebrate Earth Day than a 100% eco-friendly, human-powered Ferris wheel? Granted, it's only available in India and is a little dangerous, but this is cool enough to take a solar and wind powered boat out there to celebrate. Poop is an invaluable resource to greenies. We may be able to turn it into fuel in the future, we can use it to help compost piles, we can use it to help insulate mud homes, and we can use it as fertilizer. We are also making a huge effort to turn it into paper. Once it's in paper form though, why are we working so hard to make it pretty -like these poopourri and elephant poop roses? I just don't understand the novelty of cute poop. Just because you're eco-friendly doesn't mean you have to give up on life's luxuries. 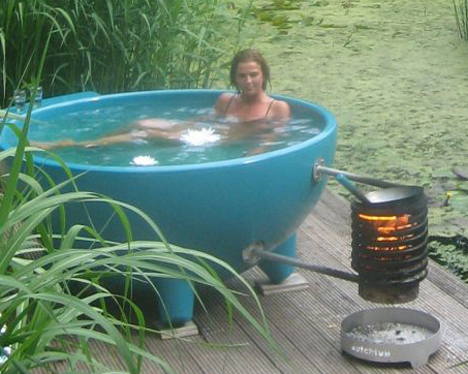 This wood-powered hot tub, known as the Dutch Tub, is a great way to have a much more natural Jacuzzi experience. Granted, is still some emissions from the wood being burned, but there's no harm in throwing some food on the wok above the flames and making the most of your green house gasses. Dinner and a dip anyone? Whatever your plans for Earth Day, have a great time and keep it green! Can Lasers Aid Australian Scientists To Collect Space Junk? Fun blog, Jill! I love the Ferris Wheel! I like this incredible products. Also, another way of helping the Earth would be to buy nothing or to buy less, in order to produce less waste. Please visit www.sustainabilitythebook.com, where we're discussing these and other ideas. Thanks! This is nice and fun way to help the planet.